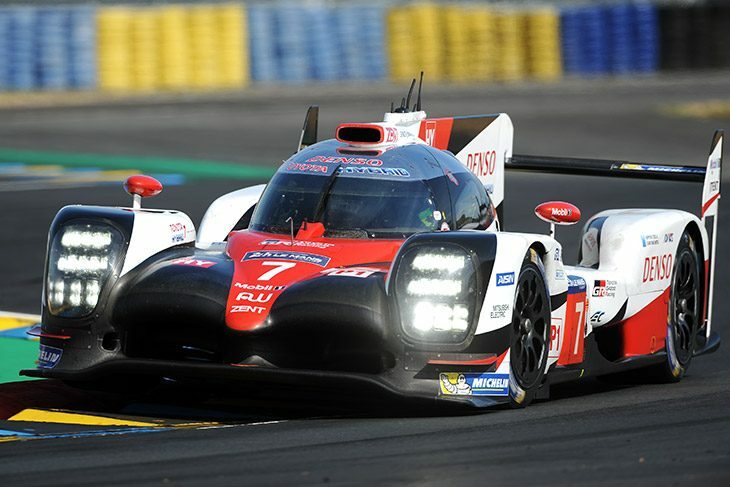 Toyota Gazoo Racing finished the 2017 Le Mans 24 Hours Test Day on top, the Japanese brand 1-2-3 after the two four-hour sessions with its TS050 Hybrids. The best time from the trio was a 3:18.132 set by Kamui Kobayashi in the #7 during the afternoon, 1.1 seconds clear of the #8 and 3.3 ahead of the #9’s best lap. Once again it was a promising run from the trio in the #9, who managed 106 laps of the circuit, good preparation ahead of race-week for rookies Jose Maria Lopez and Yuji Kunimoto. The fastest of the Porsche’s after the day of running was the #2 after the team performed an engine change between the two sessions which cost the car some track time. In the end the car managed 74 laps, the fewest in the LMP1 H division. Porsche’s second 919 Hybrid ended the afternoon fifth with a 3:22.100 by Neel Jani. 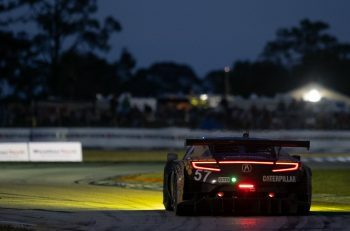 The second session, while interrupted by a few offs and a pair of red flag periods, saw no major dramas as the track rubbered in and allowed the teams and drivers to set faster times in the sunny conditions at Le Mans. 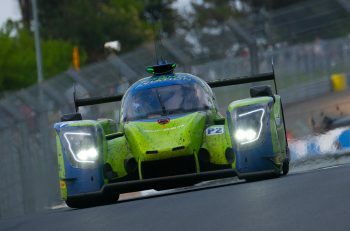 The best of the LMP2 class runners ended the day sixth overall. Nelson Panciatici set a 3:28.146 in the #35 Signatech Alpine A470 marginally quicker, than the ByKolles ENSO CLM P1/01 which set a 3:28.701 under the control of Dominik Kraihamer. Signatech Alpine’s result capped off an impressive day for Oreca, in which after both sessions’ times were combined, its 07 Gibsons locked out the top 13 positions. Second in the class was the #24 Manor Oreca after a late flyer by Jean Eric Vergne in the final minutes. The Frenchman set a 3:28.844, shortly before the sister #25 Manor Oreca of Roberto Gonzalez stopped out on circuit, causing a red flag period which lasted until the end of the session. Rounding out the top three in the class was the #37 Jackie Chan DC Racing Oreca after Alex Brundle set a 3:29.104 which briefly put him top midway through the afternoon session. The first non-Orca was once again way down the order. The #32 United Autosports Ligier was the best of the rest, the Anglo-American crew managing a 3:31.907, ahead of the Cellar Villorba Corsa Dallara P217 which finished up 15th in the 25-car class. It was a better run for the Keating Motorsports crew in the afternoon. After a fuel leak cost the team most of the morning session (the team managing nine laps with its new Riley Mk.30), the team ended up with a best time of 3:38.671 and 38 laps of running. It was good enough for 23rd in LMP2 after Jeroen Bleekemolen, Ricky Taylor and Ben Keating all had track time. In GTE Pro, the Corvette Racing team will leave confident, its #64 C7.R managing to set the best time in the session right at the end after an incredible a 91-minute engine change mid-session. Oliver Gavin set the car’s best time, a 3:54.701 to break the Porsche deadlock atop the screens to that point. Gavin’s time was a couple of tenths faster than the best of the two new Porsche 911 RSRs. Fred Makoweicki set the #91’s best tour of the circuit, a 3:54.996. The #92 finished P3, with the second Corvette fourth. Fifth in the class was the first of the Aston Martin Racing Vantages. The #95 was the quicker of the two, with a 3:55.251 by Nicki Thiim, the Dane slotting in ahead of Jonny Adam in the #97 which ended up sixth. Further down the order, the Ferraris and Fords didn’t set times capable of challenging the Porsche and Corvette ahead. The two AF Corse Ferraris finished seventh and eighth, six and a full second off Gavin. The Fords meanwhile finished the day’s running 10th, 11th, 12th and 13th. The best of the GTs – the #69 – set a 3:57.536, the slowest – which was the #66 – set a 3:58.181. Whether or not the Ganassi crew is genuinely struggling, or has something in reserve for race week, remains to be seen. It’s line at the moment is that the turbo boost restrictions in particular, are leading to a heavy impact in ultimate performance and in power delivery across the range. We hope to bring you more on this well before we gather again next weekend. Pedro Lamy put Aston Martin Racing first in GTE Am, after ex-Aston factory driver Fernando Rees sat atop the class standings for much of the session in the Larbre Corvette. Lamy’s time was a 3:58.250, a tenth quicker than Rees. The #77 Proton Porsche finished up third. In the session, outside of the aforementioned issues for various teams, the #33 Eurasia Ligier caused a red flag after Erik Maris got stuck in the gravel at the Dunlop Curves in the first hour of the afternoon session. The #17 IDEC Sport Ligier of Paul Loup Chatin and Racing Team Nederland of Jan Lammers Dallara also had a coming together at the second Mulsanne Chicane. Both cars continued to run after the incident though.